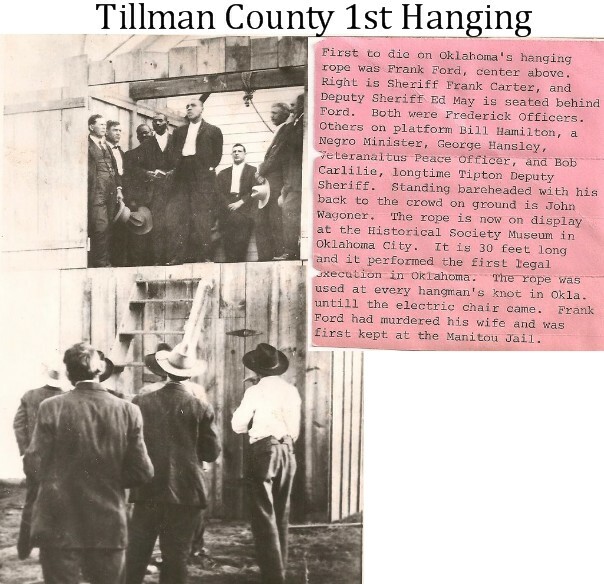 TILLMAN COUNTY HISTORY CLICK HERE! Located in southwestern Oklahoma, Tillman County was organized at 1907 statehood from a portion of Comanche County. Frederick is the county seat. Tillman County's boundaries changed in 1911 and 1924 when portions of Kiowa County were added. Named for U.S. Sen. Benjamin R. Tillman of South Carolina, Tillman County is bounded by Kiowa County on the north, Comanche and Cotton counties on the east, Jackson County on the west, and the Red River (Texas) on the south. Lying within the Red Bed Plains physiographic region (a subregion of the Osage Plains), Tillman County has 879.21 squares miles of land and water. It is drained by the North Fork of the Red River, Otter Creek, and Deep Red Creek. According to a 1981 archaeological survey report Tillman County has forty-one known archaeological sites. Of those reported, only one had been tested. However, through investigations of the area, scientists suspect activity during the Archaic (6000 B.C. to A.D. 1) and Plains Village (A.D. 1000 to 1500) periods. In the 1600s Spaniards were the first Europeans in the area, using the Great Spanish Road that paralleled the North Fork of the Red River. In 1803 the United States purchased from France the Louisiana Purchase, which included the future state of Oklahoma. Expeditions were formed to explore the area. In southwestern Oklahoma, Randolph B. Marcy headed one of those excursions in 1852 in search of the headwaters of the Red River. Due to American Indian unrest in the area, Camps Radziminski and Augur were established in 1858 and 1871, respectively. In 1867 the Medicine Lodge Treaty created a reservation for the Kiowa, Comanche, and Apache (KCA) in southwestern Indian Territory. By the 1880s prominent Texas ranchers, Daniel and William Thomas Waggoner and Samuel Burk Burnett, leased grazing lands from those tribes. In 1892 the Jerome Commission began enrolling the Kiowa, Comanche, and Apache in preparation of opening their reservation to non-Indian settlement. On August 6, 1901, a lottery was held to open those lands, and in December 1906 the area known as the Big Pasture was opened. After the 1901 lottery the towns of Texowa (renamed Olds and finally Davidson in 1902), Gosnell (became Frederick in 1902), Manitou, and Siboney sprang into existence. Eschiti and Kell City (merged to become Grandfield), Harriston (became Loveland), Hollister, Isadore, Parton, and Quanah developed after 1906. At the turn of the twenty-first century Davidson, Frederick (county seat), Grandfield, Hollister, Loveland, Manitou, and Tipton continued as incorporated towns. At 1907 statehood Frederick was designated as the county seat. Until a courthouse was built, county officials rented space in several buildings and city hall. The architectural firm, Tonini and Bramblett, designed the structure. The Charles M. Dunning Construction Company began work on the courthouse in 1921. 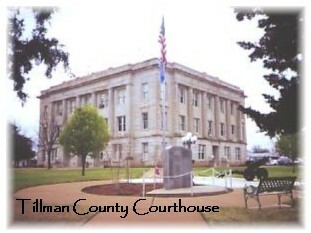 The Tillman County courthouse is listed in the National Register of Historic Places (NR 84003455). Tillman County's economy has been based primarily on agriculture. Principal crops have included cotton, corn, wheat, oats, Kaffir corn, and milo. In 1907 farmers had planted 53,110 acres in cotton, 34,583 in corn, and 17,554 in wheat. In 1930 livestock numbered 9,041 cattle, 4,084 mules, 2,190 horses, 1,647 sheep and goats, and 695 swine. That year Tillman County had 521,777 acres in farmland and the average size farm was 188.8 acres. There were 2,763 farms, and tenants operated 60.6 percent of them. An agricultural annual report for 1963 counted 38,000 cattle, 20,500 poultry, 3,200 sheep, 2,000 hogs, and 500 milk cows. That year farmers had 153,000 acres in wheat, 70,200 acres in cotton, 25,500 in sorghum, and 21,300 in barley. Through the years the number of farms have dwindled from 1,724 reported in 1950 to 587 counted in 2000. However, through farm consolidation the average size farm has increased to 819 acres as reported at the turn of the twenty-first century. A majority of the industries in Tillman County have supported farmers. By 1930 thirty-one cotton gins, six cotton oil mills, and six grain elevators operated. At that time an oil and gas refinery was located in Grandfield. In 1941 the Frederick Army Air Field opened. Cadets received training on UC-78s (trainer/light transport aircrafts) and B25s (medium bombers). The field later developed into the Frederick Industrial Park. Relocating from New York City the Centra Leather Goods company came to Frederick in 1955. In 1971 the Kellwood Plant in Frederick produced children's jeans. At the turn of the twenty-first century only two manufacturing firms reported employing more than fifty individuals. Waterways and American Indian trails formed the earliest transportation routes. After the 1901 and 1906 land openings railroads connected the recently established towns with outside markets. In 1901 the St. Louis and San Francisco Railway constructed a line from Texas north across the Red River to Davidson. Between 1901 and 1903 the Blackwell, Enid and Southwestern (BES) Railroad (later acquired by the St. Louis and San Francisco Railway) built a line from Darrow (in Blaine County) traversing south through Manitou and Frederick. In 1907 the Wichita Falls and Northwestern Railway (later the Missouri, Kansas and Texas Railroad) connected Grandfield, Loveland, Hollister, Frederick, and Tipton. Motorists used U.S. Highways 70 and 183 as well as State Highways 5, 5C, 36, and 54. Municipal airports operated near Frederick, Grandfield, and Tipton. Early settlers soon built one- and two-room schoolhouses. In Manitou a three-month subscription school operated in the winter months of 1902-03. In 1906 Frederick had a kindergarten sponsored by the Mothers' Culture Club. Between 1938 and 1942 the Tillman County Junior College offered higher education. At the turn of the twenty-first century education was offered at public schools in Davidson, Frederick, Grandfield, and Tipton. At 1907 statehood Tillman County had 12,869 residents. Numbers steadily increased from 18,650 reported in 1910, to 22,433 in 1920, and 24,390 in 1930. After the population peaked in 1930 it continually declined from 20,754 in 1940 to 14,654 in 1960. The censuses for 1970 and 1980 indicated 12,901 and 12,398, respectively. In 1990 Tillman County had 10,384 inhabitants compared to 9,287 in 2000. Theodore Roosevelt, who favored single statehood for Oklahoma, was president when the Twin Territories joined to form the state in 1907. He visited the area during the Territorial Era and after statehood. His most eventful trip occurred in 1905, when he accompanied John R. Abernathy and others on a wolf hunt in southern Oklahoma Territory. Roosevelt first became interested in Abernathy in January 1903 when Sloan Simpson, a friend from Fort Worth, Texas, described Abernathy's ability to catch wolves with his bare hands. Roosevelt thought that Simpson was exaggerating, but several months later the story was corroborated by another of the president's friends from Texas, Cecil A. Lyon. Roosevelt accepted his friends' invitation to participate in one of Abernathy's wolf hunts. On April 5, 1905, Roosevelt traveled through Indian Territory on his way to a Rough Riders reunion in San Antonio, Texas, making short speeches at several towns along the railroad between Vinita and Durant. After attending the reunion, Roosevelt returned to Oklahoma Territory, arriving in Frederick on Saturday, April 8. While giving a speech to the thousands gathered to greet him, he noticed Comanche Chief Quanah Parker and called him to the speaker's stand to shake his hand. Immediately after the speech, the hunting party left for the Big Pasture, an area of 480,000 acres of open range in present Tillman, Comanche, and Cotton counties. Members of the party included the president's personal physician, Dr. Alexander Lambert, several former Rough Riders, a number of cattle ranchers, and Quanah Parker. Although no hunts were planned for Sunday, they took place on each of the next four days. 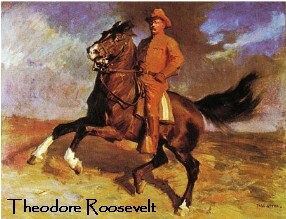 Roosevelt impressed the other participants with his riding ability during the wolf chases, as he was the only one who could keep pace with Abernathy. At least one other member of the party attempted to catch a wolf, but only Abernathy succeeded. He caught several wolves using a technique of waiting until the wolf leapt at his outstretched arm and then grasping its lower back teeth or tongue before it could bite down, thus keeping the animal's canines from doing any major damage. 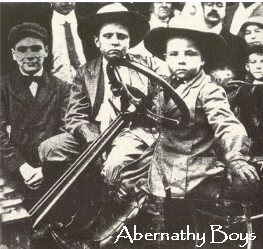 Roosevelt was impressed with Abernathy's ability and greatly enjoyed the hunts as well as other camp activities. On Thursday evening, April 13, 1905, the president left Frederick to continue his adventures on a bear hunt in Colorado. In 1910, brothers Bud and Temple Abernathy rode on horseback from Frederick, OK to New York City to meet former president Teddy Roosevelt. For the ride home they changed their mode of transportation to a 1910 Brush Runabout, making the 2500 mile trip in a record setting 23 days. Quite a feat a time where there were no interstates and desperados still roamed the wild west. Even more impressive is the fact that Bud and Temple were only six and ten years old. 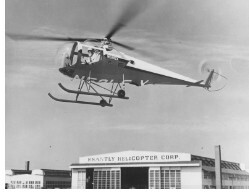 Historical photo of a Brantly B-2 flying near the factory in Frederick Oklahoma . The model B-2 was certified in 1959 and the factory was moved in 1967 or 68. Since the model B-2A was introduced in 1962, this picture was most probably taken in the period 1959-62.